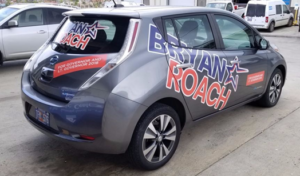 Bryan/Roach Campaign’s “Course Changer” a Nissan Leaf electric car, is ready to assist in Getting Out the Vote on St. Thomas. Call 201-3410 to schedule rides to ESVI or to the polls. New-age technology, energy efficiency and excellent customer service are encompassed in the platform principles of the Bryan/Roach campaign for governor and lieutenant governor. 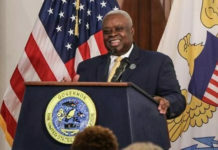 Enthusiastic to demonstrate how such principles can be put into action to improve the quality of life for Virgin Islanders, the team has found a unique way to offer a much-needed service to St. Thomas residents. The Bryan/Roach Course Changer, an electric powered car, is now travelling St. Thomas roads available to those needing transportation to register to vote at the Election System office in Lockhart Gardens Shopping Center. Easily recognizable with the campaign’s bright blue and orange logo, the car will also be available to voters for free rides on Aug. 4, primary day for the Democratic Party. Residents should call 201-3418 to schedule a ride. The energy efficient Nissan Leaf, one of approximately 50 on St. Thomas, is an all-electric vehicle (EV) that has no tailpipe, produces no polluting emissions and contributes to reduced dependence on petroleum, an expensive commodity in the Virgin Islands. Equal power applied to all four wheels allows the vehicle to travel up hilly terrain without loss of performance, and the regenerative braking system helps in recharging the batteries going downhill. With less moving engine parts, maintenance is simpler and less expensive. According to Bryan, the storage capability of batteries in electric vehicles charged at solar stations can potentially make more renewable energy available to feed into the island’s power grid in the future. “This would be just one of the innovative ways we will vigorously explore to reduce the cost of electricity for Virgin Islands customers,” said Bryan. Easy to transport between islands, lieutenant governor candidate Sen. Tregenza Roach noted how much the candidates enjoyed taking the “Course Changer” to St. John recently to meet up with supporters. “Clearly, it is not necessary to have a government fleet of big gas guzzling cars to get the work done. We must always look for ways to be the best stewards of the government’s dollars. If we are going to Change Course Now, we’ve got to get moving by doing it in a better way,” said Roach. 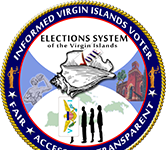 As timely reminders, voters have until July 5 to register or change party registration at Election System offices throughout the territory before the Democratic primary on Aug. 4. The last day the Supervisor of Elections will accept absentee-ballot applications for the primary election is July 17. For forms and other voting information visit www.vivote.gov.